The playoff battle in the Eastern Conference is already heating up when the Toronto Maple Leafs take on the New York Islanders at the Air Canada Centre on Tuesday night. The Leafs, who are coming off two losses in a row, sit just one point up on the Islanders and Philadelphia Flyers in the race for the final wildcard spot. But the Leafs also sit just three points behind the Bruins with four games in hand. That being said, the Islanders have seen a resurgence as of late. Since the team fired former head coach Jack Capuano, New York has won eight of their 12 games under Doug Weight. The Leafs will look to their young guns to get their offence back on track as Mitch Marner has led the way for the team over the past six games. Over that span he has three goals and six points to lead the Leafs. While he’s only played two games against the Islanders in his short career, Marner does have a goal against them. It should be a fast-paced game with its fair share of offence. But expect Mike Babcock’s Leafs to come out with something to prove after having the past two days off following a 3-1 loss to the Buffalo Sabres. 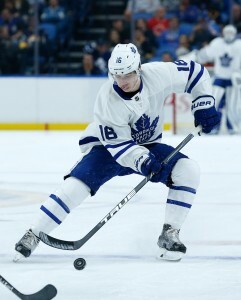 1)Tyler Bozak, who has been one of the hottest Leafs over the past six games, is tied with Sid Smith (183) for 29th on the Leafs all-time assists list. With one more assist, Bozak will tie Tod Sloan (184) for 28th on the franchise’s all-time list. 2)Josh Bailey has 11 goals and 38 points this season. With just one more tally, the Islanders forward will tie Benoit Hogue and Ed Westfall (105) for 26th on the Islanders’ all-time list. Two more points and he will also tie Alexei Yashin (290) for 22nd on the team’s all-time points list. 3)The Islanders and Leafs have met 150 times over their existence. The Leafs lead the all-time series 68-65-7-10, but the Islanders have out scored Toronto 533 to 485 over that span. 4)The Islanders are coming of a win and are 6-2-2 in their last 10. 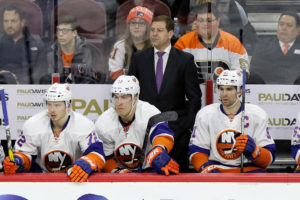 With Weight as their head coach, the Isles have an 8-2-2 record in 12 games and have climbed the Eastern Conference standings – sitting just one point out of a wildcard spot. 5)The Maple Leafs are looking to stop the bleeding, coming off two losses in a row. They’re 4-4-2 in their last 10 and sit just one point up on the Islanders and Flyers for the final wildcard spot. The winner of this game will have some bragging rights as they will hold the final playoff spot in the Eastern Conference. Don’t expect either team to give up opportunities that easily, but it’ll take a big performance from either Greiss or Andersen to pick up two very big points.